Two lanes of northbound I-5 will close from McKinley Way to 28th Street from 10:30 p.m. to 4:30 a.m. Tuesday. Two lanes of northbound I-5 will close from McKinley Way to 28th Street from 10:30 p.m. to 4:30 a.m. Wednesday. Northbound I-5 exit to westbound SR 16 will close from 11 p.m. to 4 a.m. Wednesday. Southbound I-5 exit to South 38th Street will close from 11 p.m. to 5 a.m. Wednesday. Two lanes of northbound I-5 will close from McKinley Way to 28th Street from 10:30 p.m. to 4:30 a.m. Thursday. Southbound I-5 exit to South 38th Street will close from 11 p.m. to 5 a.m. Thursday. Two lanes of northbound I-5 will close from McKinley Way to 28th Street from 10:30 p.m. to 4:30 a.m. Friday. Northbound I-5 exit to westbound SR 16 will close from 11 p.m. to 4 a.m. Friday. 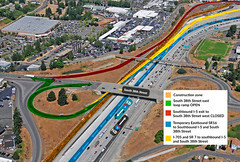 South 38th Street on-ramp to southbound I-5 will close from 11 p.m. to 5 a.m. Friday. Northbound I-5 is reduced to a single lane from McKinley Way to 28th Street from 11:59 p.m. to 4:30 a.m. Saturday. SR 167 on-ramp to southbound I-5 will close from 11 p.m. to 7 a.m. Saturday. Northbound I-5 exit to Port of Tacoma Road will close from 11:59 p.m. to 6 a.m. Saturday. 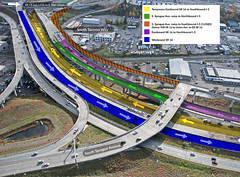 East 28th Street on-ramp to northbound I-5 will close from 11:59 p.m. to 6 a.m. Saturday. Northbound I-5 exit to westbound SR 16 will close from 11:59 p.m. to 7 a.m. Saturday. South 38th Street on-ramp to southbound I-5 will close from 11 p.m. to 7 a.m. Saturday. Southbound I-5 exit to South 38th Street will close from 11:59 p.m. to 7 a.m. Saturday.